Click here to see the Rewards. These rewards are only available to players who have bought the battle pass. These rewards are only available to players who have bought the battle pass and have an active Patron Sub. 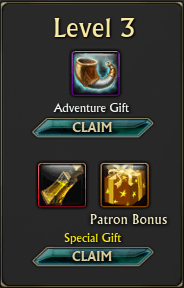 Patron will be required to claim the rewards. You do not need to have an active sub for the entire Season, only when you want to claim the rewards. 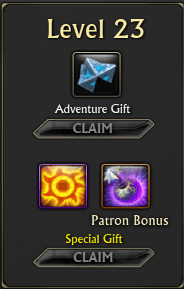 Rewards can be claimed retroactively within the same pass, ie: if you unlocked all the rewards and then purchased a Battle Pass or Patron Subscription, you can claim the previously unlocked rewards in that pass. Be careful which character you claim your rewards on, a lot of them are BIND ON PICKUP, especially the cosmetic effects. (awaiting to see if Devs will change this to Bound to Account). 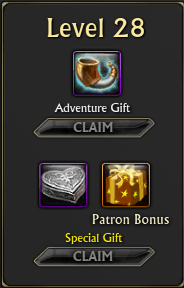 Click the picture above for a quick list of rewards. 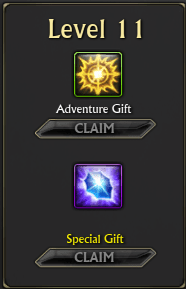 Reward 1: A Star Shine Cache: Usually contains some platinum and some healing or mana pots. 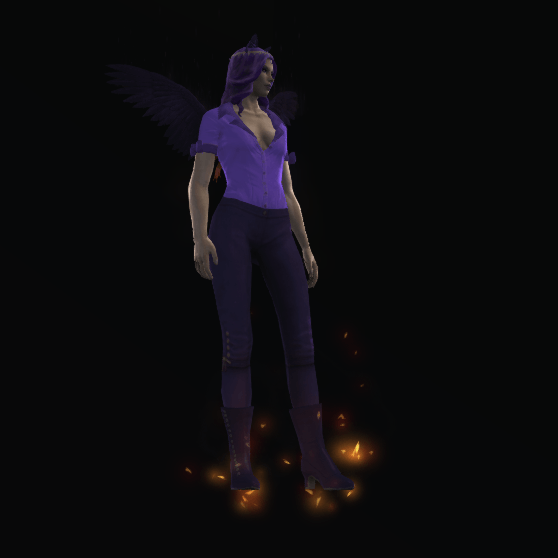 Reward 3: Pants on Fire: Description: ‘Sets your pants on fire’ – Will have more info on this at a later date! Lvl 17: Jump Effect: Blast Off! 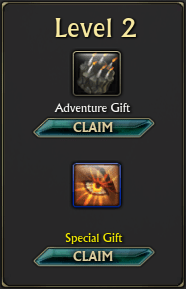 300 credits to spend on anything you want from the Rift Store! When you claim this gift a bound to account container will appear in your bags with 50 IRC inside. You can pop this container in your bank and open it when you need more IRC. You can find out about IRC here. 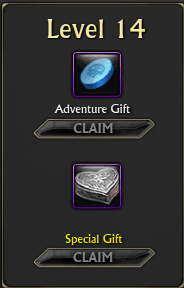 The 1st artifact in the Pants on fire set. An item that puts a fire effect on your eyes. 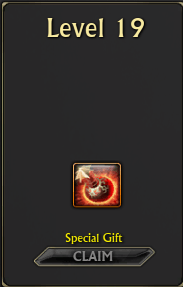 Using this item places a ‘Flaming eyes’ buff on your buff bar, you can remove it by right clicking the buff. This device is used for removing Planar Essences from your Planar Focus so you can upgrade them or place them in a different focus. 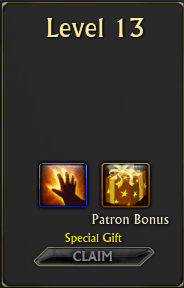 A single use vial that increases your Favor rewards by 160% for 2 hours. A selection of artifacts of up to Relic quality. 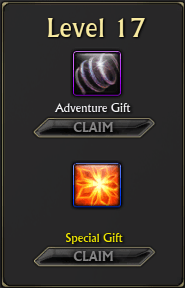 You can spend Affinity in the special Affinity Tab of the Rift Store. 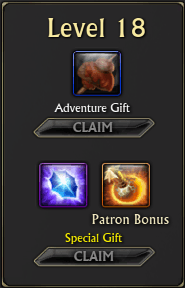 Here you will find Pets, Mounts, Minions and other items. 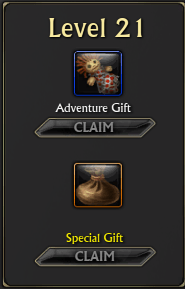 When you claim this gift a bound to account container will appear in your bags with 5 IRC inside. An item that puts a fire effect on your feet. 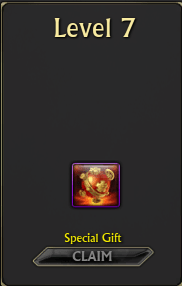 Using this item places a ‘Hot feet’ buff on your buff bar, you can remove it by right clicking the buff. 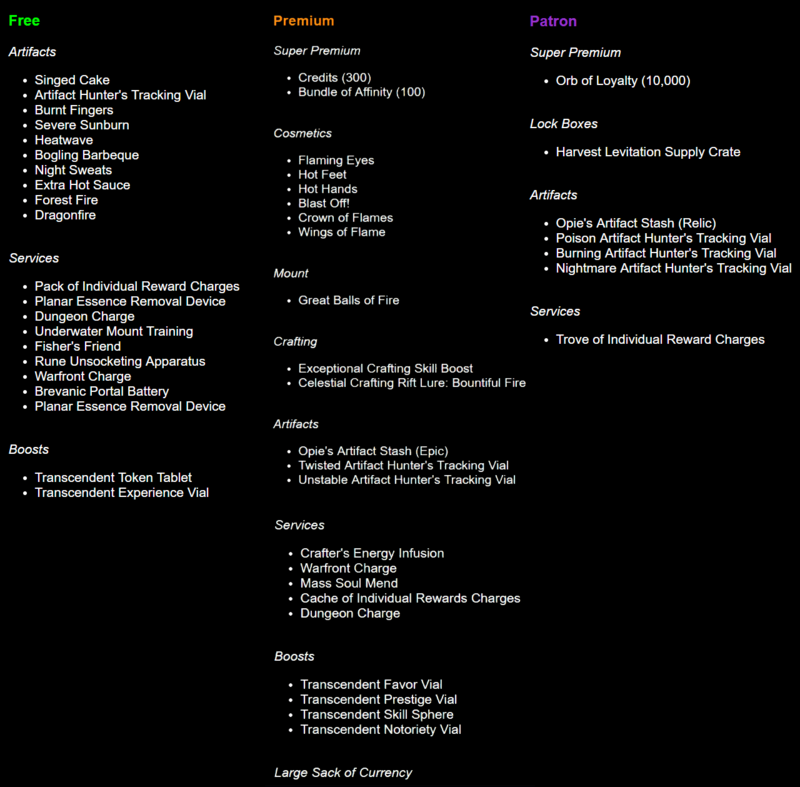 Contains a random selection of currency, equipment, novelty items, potions, or runes with a bonus chance at service items. Contents may be appropriate for your level range, up to 70. 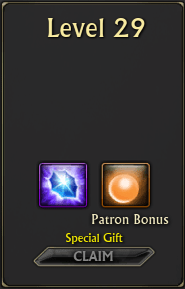 It also includes a chance at the Harvest Levitation mount. 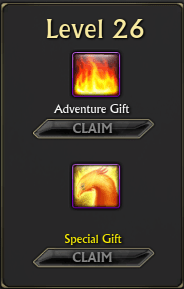 The 2nd artifact in the Pants on fire set. A selection of artifacts of up to Epic quality. Adds 10,000 Loyalty to your account. This will show you all Normal Artifacts on the mini-map for 30 minutes. A single use vial that increases your Token (currency) rewards by 160% for 2 hours. 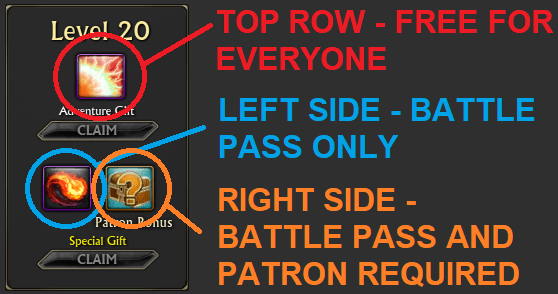 This does not work on the current top tier raid currency. This will show you all Poison Artifacts on the mini-map for 30 minutes. A usable item that adds a random Dungeon charge to your character. 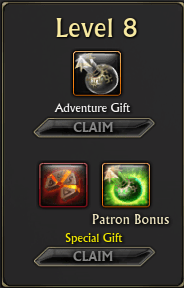 This will increase the rewards that you get from completing a random dungeon. 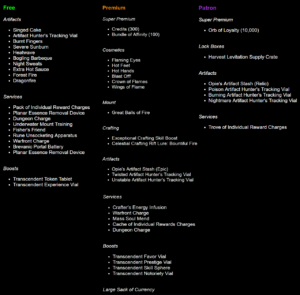 You can see how many charges you have in the LFG UI. A usable item that adds a random Warfront charge to your character. 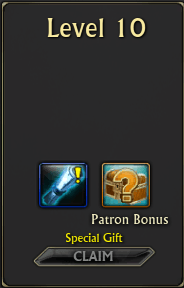 This will increase the rewards that you get from completing a random warfront. You can see how many charges you have in the Warfront UI. This scroll will boost a craft skill up to level 450. 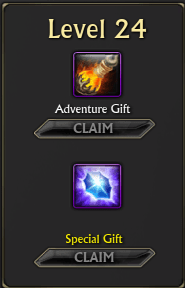 The 3rd artifact in the Pants on fire set. 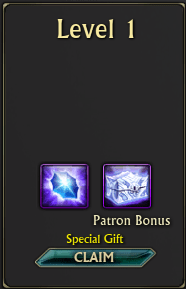 Use this item on one of your mounts (in the character screen > mounts) to train them to be able to swim underwater! This crafting boost will last for 2 hours. It will significantly increase your crafting XP form everything you craft during that time. The new Hot Hands effect! You can see what this looks like in the preview video at the top of this list. 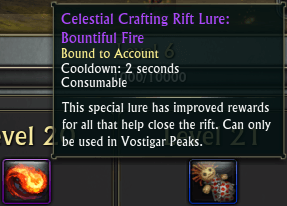 Resets the cooldown on all fishing lures.. including Artifact Lures and Stan’s Lure. The 4th artifact in the Pants on fire set. Heals the soul of every player in your party of raid. A single use vial that increases your Notoriety rewards by 160% for 2 hours. Adds 50,000 Loyalty to your account. Removes a Rune from a gear item so you can upgrade the gear without losing the rune, or use the Rune on a differen gear item. The new fire jump effect! You can see what this looks like in the preview video at the top of this list. 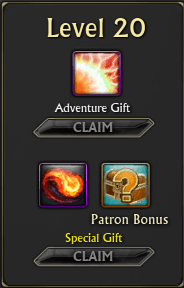 The 5th artifact in the Pants on fire set. This will show you all Burning Artifacts on the mini-map for 30 minutes. This will show you all Twisted Artifacts on the mini-map for 30 minutes. 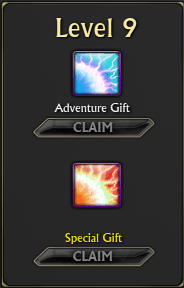 A new type of Crafting Rift! 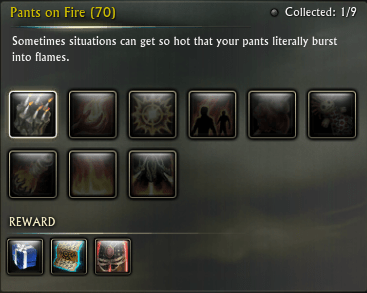 The 6th artifact in the Pants on fire set. 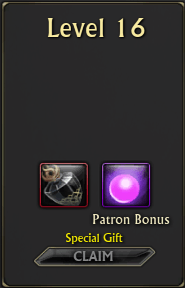 Contains currency appropriate to your level. 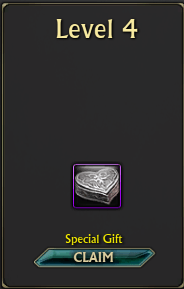 When you claim this gift a bound to account container will appear in your bags with 20 IRC inside. 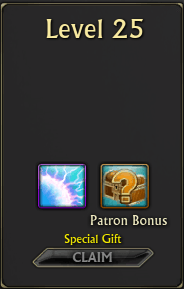 Resets the cooldowns on the Brevanic Portal Generator and Patron Fast Pass abilities. 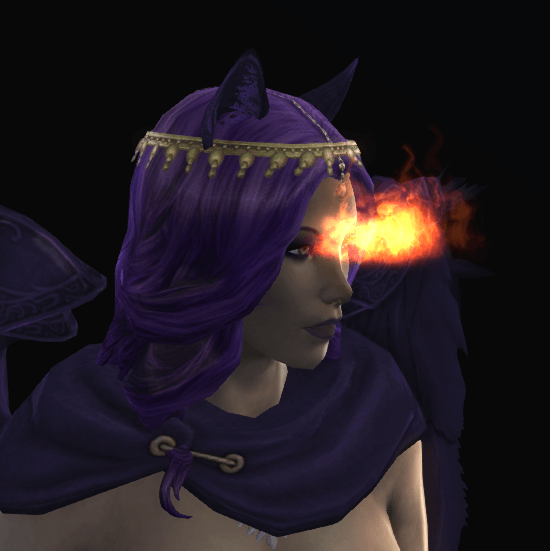 The new fire crown! You can see what this looks like in the preview video at the top of this list. 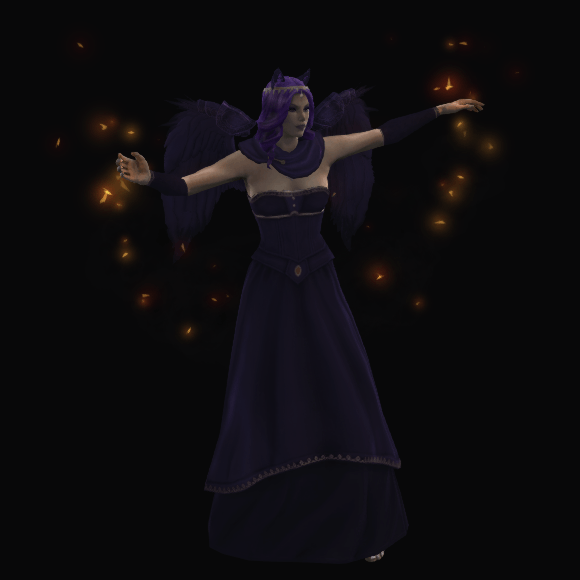 You can also open up your wardrobe screen and click the ‘show uncollected’ button to preview this in game. This will show you all Nightmare Artifacts on the mini-map for 30 minutes. 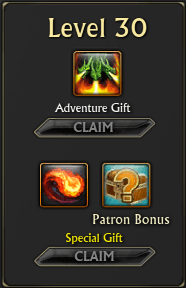 The 7th artifact in the Pants on fire set. The 8th artifact in the Pants on fire set. 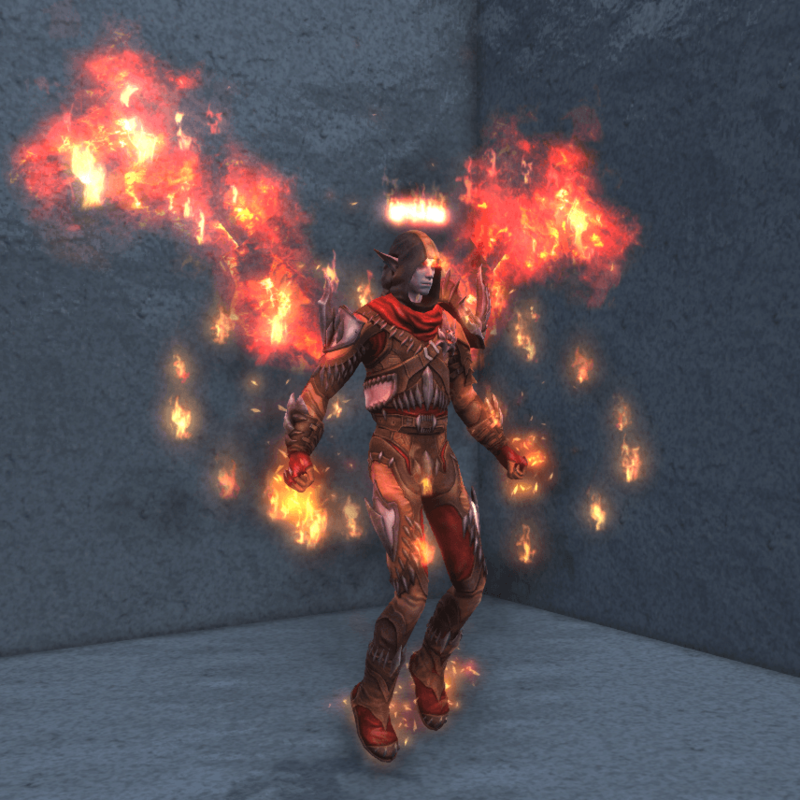 The new fire wings! You can see what this looks like in the preview video at the top of this list. This will show you all Unstable Artifacts on the mini-map for 30 minutes. Adds 100,000 Loyalty to your account. 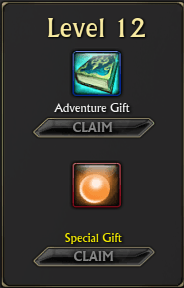 The final artifact in the Pants on fire set. The new fire mount! You can see what this looks like in the preview video at the top of this list.